Hot on the heels with the news that their 2003 breakthrough single “ Ocean Avenue ” has just been certified platinum (over one million sold), American pop-punk band YELLOWCARD have another reason to celebrate: this year marks the tenth anniversary of that single and its album of the same name. To kick it off, Yellowcard and Hopeless Records are releasing Ocean Avenue Acoustic, a re-imagining of all 13 songs from that album in an acoustic setting. “On July 22, 2003 our lives were changed forever,” says the band in a joint statement. “We didn’t know what Ocean Avenue would become, but it is a chapter in our story that we will never forget. We knew that for the 10th anniversary of the release we wanted to do something more than just a tour.” Special limited edition pre-order packages of the album including exclusive white vinyl, a one time only pressing 7″, hand written lyric sheets by Ryan Key and more are available now at Moment.Yellowcardrock.com. Soon after the release of the acoustic album, the band will hit the road throughout the US as part of House of Blues 20th Anniversary Presents, performances at Harley Fest and Riot Fest, and in Europe and Australia. “In the US and Australia, we will be performing the entire [Ocean Avenue] record acoustically from start to finish, and then closing the show with an electric set that covers the other albums,” they explain. “In Europe, we will be playing the Vans Warped Tour , so the headlining shows will just be Ocean Avenue Acoustic. To hear the other records you’ll have to get to the closest Warped date!” (tour dates below). With over two and a half million albums sold and counting, Yellowcard continue to dominate the music world, garnering fan support and critical acclaim alike. 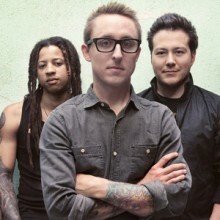 With eight singles that have received significant Top 40 and Alternative radio airplay including the smash “Ocean Avenue”, Yellowcard continued their steady progression with their eighth and latest solo album Southern Air on Hopeless Records last year. Debuting on Billboard ’s Top 200 Album Chart at #10, Southern Air is their fifth album to reach the Top 20 (and second in the Top 10). Yellowcard is Ryan Key (vocals/guitar), Sean Mackin (violin), Longineu (“LP”) Parsons (drums), Ryan Mendez (guitar) and Josh Portman (bass). Ocean Avenue Acoustic will be released via Hopeless Records on August 13, 2013 .